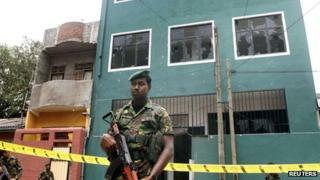 The Sri Lanka Muslim Council confirmed that the mosque which was attacked would be abandoned for an older place of worship which the government had previously earmarked for demolition. "We have a compromise deal worked out last night," Council President NM Ameen told the Agence France-Presse news agency. "From today, we are out of the new mosque," he said. After a meeting with religious leaders the government withdrew plans to develop a canal behind the old mosque, allowing Muslims use of that site once more. "Through a just solution, we have now peacefully solved the issue," minister Champika Ranawaka told reporters. But the violence has sparked criticism, with Sri Lanka's main opposition UNP party condemning authorities for failing to make arrests. "Not a single arrest [has been] made so far, when it comes to attacks against religious places over the past year. This why we are seeing more and more attacks," MP Harin Fernando told the BBC. A US embassy statement said that the incident was "particularly troubling in light of a large number of recent attacks against the Muslim community". The past year has seen mounting religious tension in the country as hard-line Buddhist groups have attacked mosques and Muslim-owned businesses, as well as churches and clergy. Buddhist hard-liners accuse Muslims and Christians of promoting extremism and trying to convert Buddhists to their own faiths. Both Muslims and Christians have denied such accusations. The Buddhist Sinhalese community makes up three-quarters of Sri Lanka's population of 20 million. During Sri Lanka's bitter civil war, the Muslims - a small Tamil-speaking minority, about 9% of the population - kept a low profile, but many now fear that ethnic majority hard-liners are trying to target them. Why are monks attacking Muslims?